The bright clear sky is an intense blue. It is crisp out but it will be warm this afternoon, so I am dressed in layers. There is a sweet smell in the air of dampness. The mosses have turned dark green from the moisture. I am aware of a sense of relief within me because we have had a few inches of rain. It is almost as if every living thing has breathed a sigh of relief! 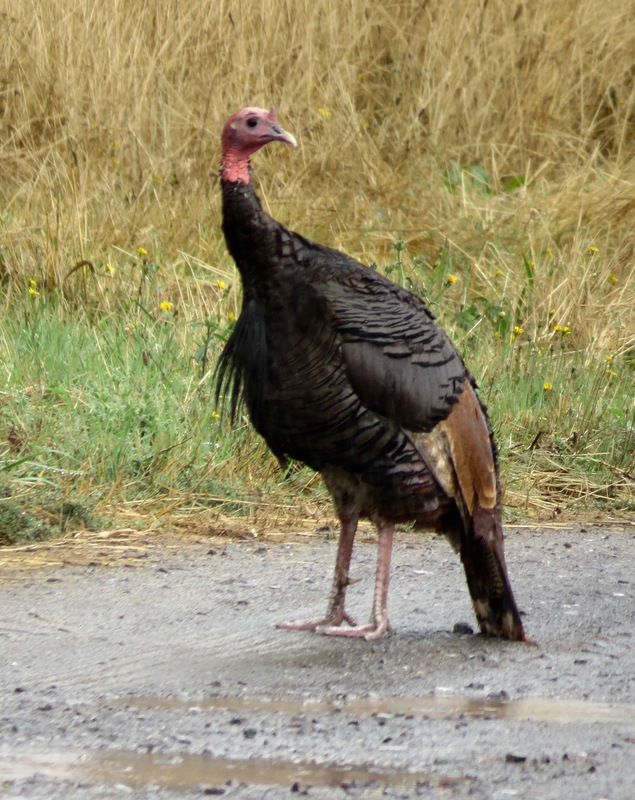 During the rain, I was out and saw a few bedraggled creatures like this wild turkey, and the turkey vultures were looking very wet, but today all the birds seem delighted and full of energy. 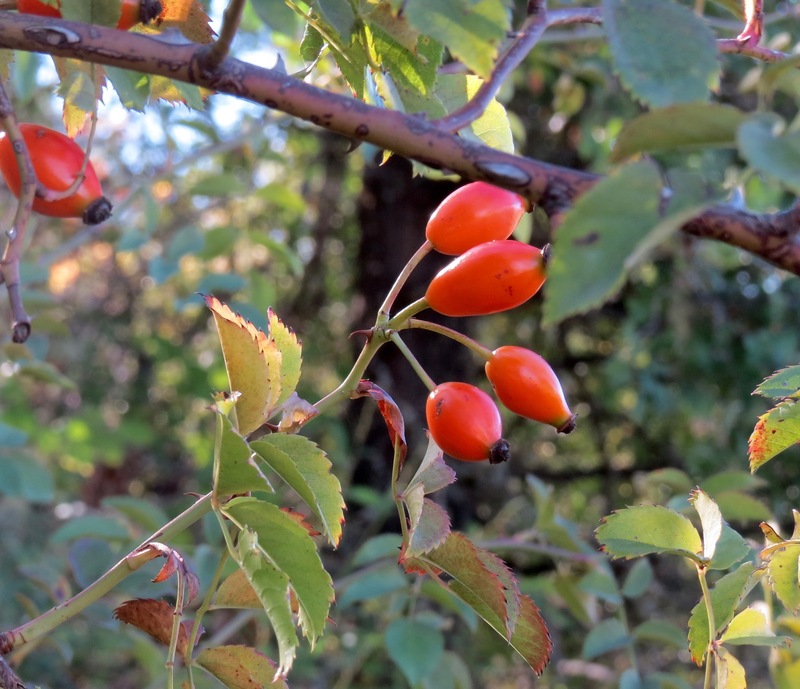 The colors are rich and vibrant especially certain plants, such as the rose-hips from our wild roses, Rosa californicus, or Rosa gymnocarpa, which are bright red. These are food for the Black-tailed deer, Odocoileus hemonius, and for many species of birds and rodents in the lean winter months when no other fruits are available. These fragrant fruits are also an ancient medicine still in use now by many people because they are high in vitamin C and can be used for jellies and teas. These clusters are also nice additions to seasonal wreaths and bouquets. The other berry I notice on my walk is the Snowberry, Symphoricarpus albus var. laevigatus. 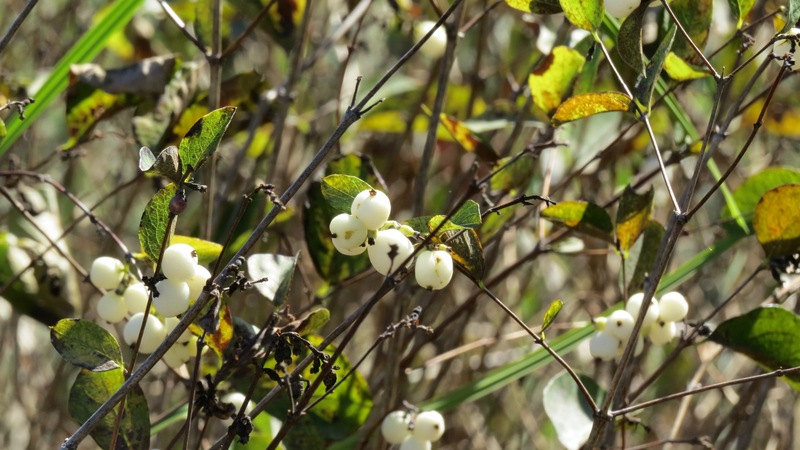 This is a small-leaved shrub with pure white berries this time of the year into winter. 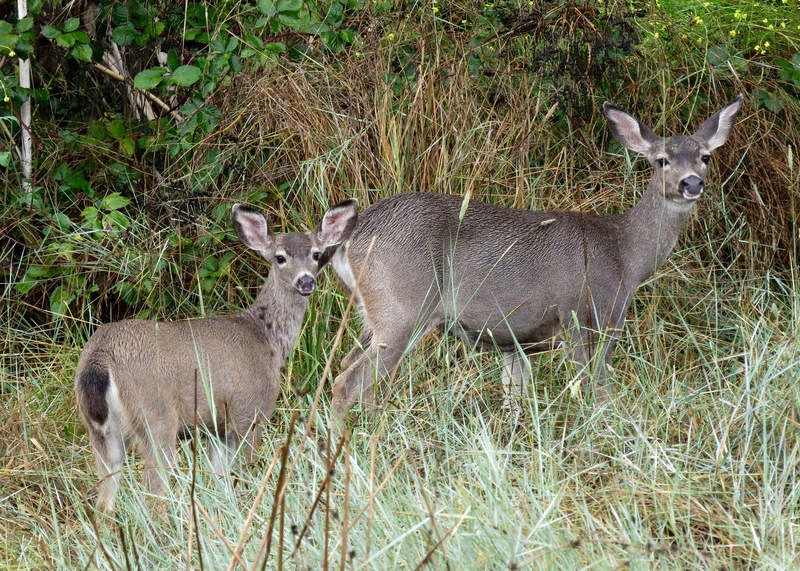 The berries are not edible and do not seem to be an important food for wildlife but the shrub itself is an important browse for deer, and elk, and shelter for small mammals. The moisture in the soil is already sprouting many tiny seedlings causing a fine green layer to appear in these grasslands. It is impressive to see how much difference a small amount of rain makes on this landscape!